The FITS Zephyr Show Coat is revolutionary in design! 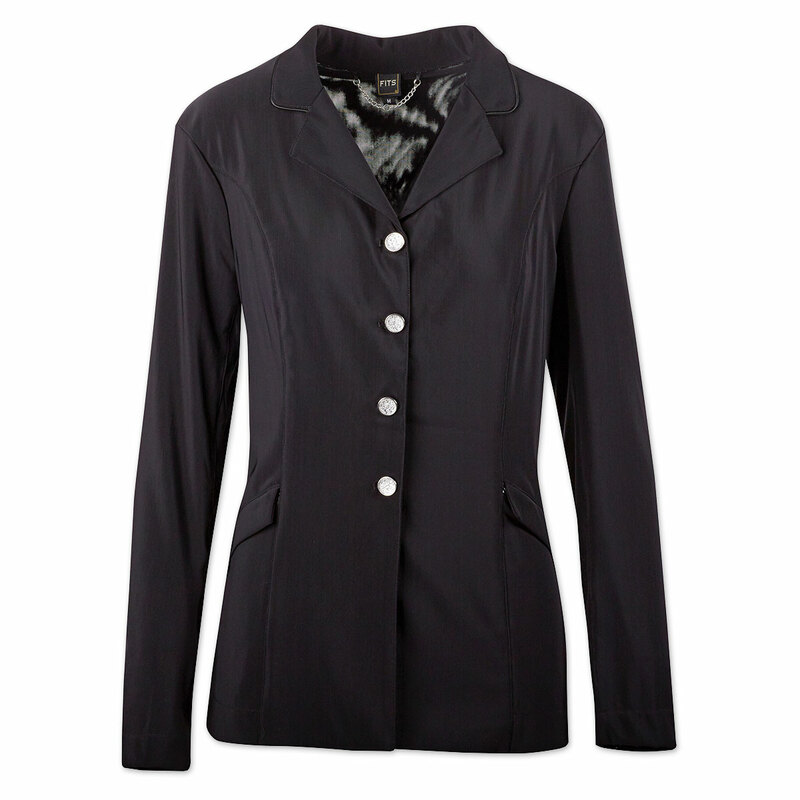 Constructed of varying layers of PowerMesh, an open cell fabric, this is the lightest, most breathable coat available. FITS Zephyr Mesh Dressage Show Coat is rated 4.6 out of 5 by 24. Rated 4 out of 5 by SPreviewer from Disagree with other reviewers: runs SMALL! I carefully read other reviews and decided to get an XS but it's too small! I'm petite (5'2" tall; about 108 pounds), and it's too tight in the arms, too short, and overall too snug. I mostly wear size 0 or 2 clothing; size 24 breeches, so seemed XS (0-2) would be perfect. I'm returning for a small, hoping that will fit. Other than the fit issues, it's a very pretty coat; great fabric with some weight and substance, but seems light for warm weather shows. Really stretchy fabric, but too snug in the arms and overall fit seems small. Good price for a coat of such good quality. Rated 5 out of 5 by Cathy from Great weight and long sleeves for a taller rider I have a hard time finding show clothes that are long enough for my daughter. We bought the jacket due a crazy how summer and fall but ended but with a new favorite. This jacket is her go too due fit. For once the jacket off the rack that showed her waist and was long enough in the arms. No alterations needed....wow!!! Rated 5 out of 5 by J P P from Perfect Even though this jacket has some weight to it (so it hangs well), the material feels wonderful on and the jacket looks very smart. On those hot show days, the air passes through and gives you a cooling effect. Love the easy care fabric, and it comes out of the wash great. Just needed a light iron to set the collar/lapels. Not in love with the square box shape on the hips, but works well for jumpers, just slightly less elegant for dressage. I have long arms and the sleeves are plenty long enough for me. I am 5'7", 35" bust with narrow hips and I ended up with the Medium size. Small would have worked if you like a tighter fit, but I decided I wanted more room under my arms for the option of a long sleeve shirt. It took me many years before I was willing to buy what I would consider an expensive show jacket.... and so glad I decided on this one. Rated 5 out of 5 by LeosMom from Perfect Florida show coat Nice long sleeves, lightweight, pretty details. True to FITS sizing (I wear S in FITS). My Pikeur Diana is a 12 for comparison's sake. Rated 5 out of 5 by Breechaholic from Perfect for hot California weather! I bought this jacket to wear for summer shows in hot Northern California weather. Yesterday was the first time I wore it and I was so very pleased! I even decided to wear it through my warm up instead of just putting it on for my test and I was surprised at how comfortable is was even though it was over 90 degrees! The sleeves do run a little long so I had to shorten them. Rated 5 out of 5 by Jillyfrags from Great fit and super lightweight! Great fit for a tall rider (arms are actually long enough without alterations!). Love the cool fabric - I can still look professional in the ring without compromising comfort and coolness! Rated 4 out of 5 by Appy lover from Great fit Haven't worn yet, but seems to have quality construction. Material is very giving, yet holds its shape. Will be nice and cool for those summer shows. Says its machine washable, if it doesn't hold up, I will amend my review. Rated 5 out of 5 by Jess B from Wonderful warm weather show coat I forgot my coat at my last Horse Trial and borrowed this from a friend - I wore it in both dressage and SJ and got so many compliments! Dressage was a sloppy mess and the coat got splattered - it wiped right off! It fit me like no coat off the rack ever has. Now I have to buy one - off to sell all my other ones! The sleeves are long but I like that my wrists don't stick out when my arms are bent. I would recommend this in a second! Rated 5 out of 5 by Ladybug51 from Great looking and easy to care for I just bought this coat and wore it to compete two horses at the Aspen Farm Event near Seattle. The styling is great and it looked good after a weekend hanging around stalls and in my trailer. I just washed it and it looks fine after hanging to dry. The fabric is lightweight and breathes well, but you definitely can't see through it. I'm pretty small and the size XS was a little too big. for more average sized people, the fit is probably good. Rated 1 out of 5 by Mkb1 from Did not like Purchased jacket for a summer show coat in Florida. I returned as I did not like fit. Thought it was boxy and not figure flattering.